I definitely did not anticipate that a red mesh dress by Singaporean designer Max.Tan would be turned into an edible study in deconstructing, and then re-assembling, the perfect red velvet cake. Don't know about you but hearing the words "red velvet" always makes me think of those wondrous events where mere mortals are kept away from the celebrities by velvet ropes. In the United Arab Emirates, there is no lack of premieres or celebrities, as highlighted by recent sightings that ranged from Jackie Chan to Brad Pitt (plus Angelina), Dennis Quaid, Malala and the entire Star Trek Beyond cast. Things are only bound to get steamier once the Dubai International Film Festival kicks off in early December. Yet when I asked three Dubai-based master chefs to draw inspiration from the fashion exhibited as part of the Vogue Fashion Dubai Experience and create their own gourmet creations, I never expected that this style and taste experiment would turn into a kind of metaphor for life. And I definitely did not anticipate that a red mesh dress by Singaporean designer Max.Tan would be turned into an edible study in deconstructing, and then re-assembling, the perfect red velvet cake. 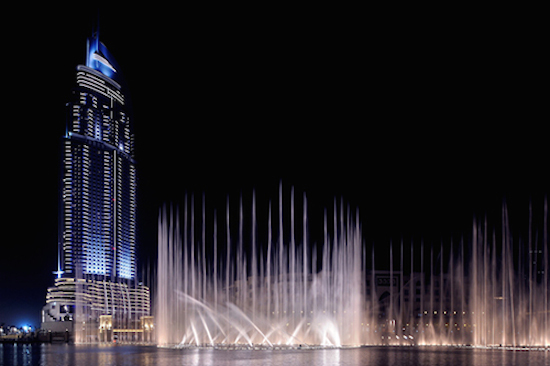 I started out knowing full well that I would be awed by the wonderful ambiance of Downtown Dubai, now a must-visit tourist destination but also a gourmet and fashion mecca for any self-respecting jet-setting world traveler, and that the chefs' creations would remind me why I love food -- and those who prepare it with passion -- so much. But what I didn't expect was to find such distinct interpretations by three men who each represent the best the world has to offer. As chefs of course but also, most importantly, as human beings. 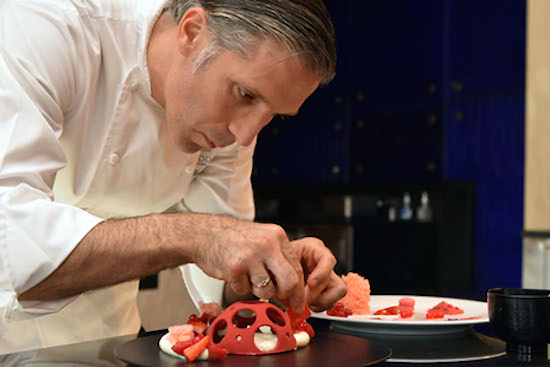 While seafood was conquered by chef Steve in part one of this series, dessert undeniably belonged to chef Abel Vieilleville, the Executive Pastry Chef for The Address Downtown. The wonderfully soft-spoken, Cannes native explained that when he went through the collections by the various designers, the red-mesh dress creation by Max.Tan, a design house based in Singapore, "inspired freedom in me." And what a beautiful word that is, freedom. Chef Abel continued, "the design is really wide, the dress is made out of mesh, it is beautiful, and although like a structure that looks really fabricated, it's really light." Chef Abel has worked in the food industry for the past 24 years, after studying in the South of France. His parents owned a restaurant for 26 years and so, chef Abel explained, "I was brought into the business at an early age, always focused on dessert." His first move away from French kitchens was to England, where he worked with Michelin-star chefs, and after working with Chinese-French fusion cuisine in the UK, decided to move to China, which he called, "a fantastic experience." When I asked the chef if he thought food to be an international language, he pointed to his time in China, where he said, "ninety-nine percent of the staff was Chinese, so we had a language barrier, yet people could understand better, through a dish, the vision of the chef." Finishing with another gem, "food helps to communicate." His move to The Address Downtown was through what he calls "the stepping stone, of neighboring Oman," but he admitted that he always wanted to come to Dubai, which he believes, "has the ability of becoming the city of the future." As far as those looking to join the culinary arts, chef Abel was kind enough to give away the secret of success by pointing out that, "as a chef you need to be passionate and give one hundred percent of yourself. Passion is not something that you learn, you cannot teach it." 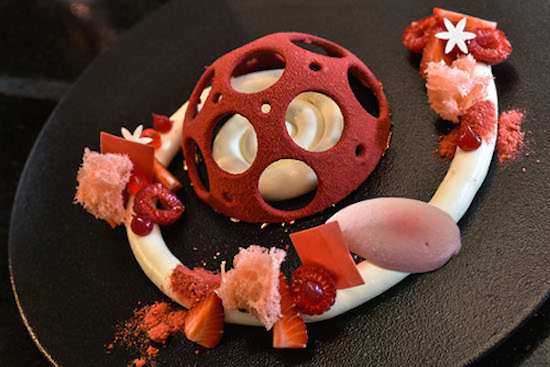 Chef Abel named his architectural, stylized creation very simply "Red Velvet". It is his homage to the beloved cake, possessing all the traditional ingredients, down to the cream cheese frosting, and the chocolate, contained in both the dome and in the small berry flavored flat squares and white chocolate flowers. 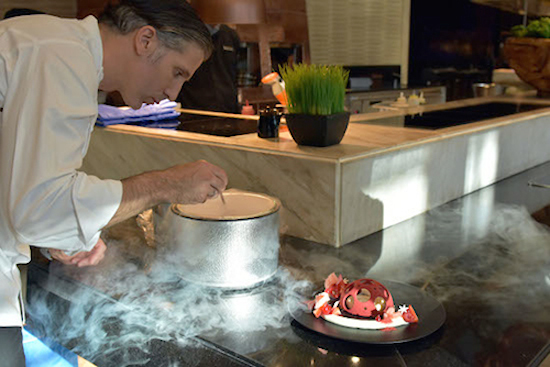 The berry sorbet went through a whole theatrical production, which of course made the dessert even more spectacular, with the help of liquid nitrogen, poured on with giant insulated gloves. To end the day, I managed to book a treatment at The Spa at The Address. I got their 60-minutes signature massage, which combines aromatherapy and Swedish techniques. When my therapist introduced herself as "Jelly" I knew I'd found my own private sanctuary, a mixture between the spa of my dreams and the grown-up version of a candy store, though one surrounded by glamour, fashion and all the dates I could eat. 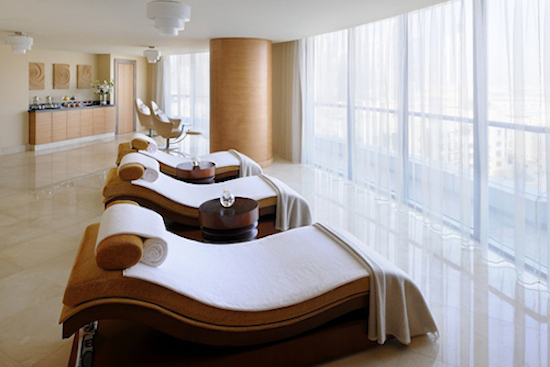 Yes, because there are incredible Emirati dates in the relaxation room as you re-emerge from your massage -- enveloped in a hot shoulder wrap , sipping cucumber/mint water and overlooking the beauty of Downtown Dubai. For some famous last words, check out the YouTube video below to hear what chef Abel had to say when I asked him about his favorite dessert -- you know, that go-to dish he turns to in those times of need, when even a sublimely talented, wonderful culinary artist needs some soul healing.